We don’t come by our sports heroes easily — at least I didn’t anyway. As a presumably well-adjusted American youngster I was pulled into the all-encompassing fervor surrounding the icons of the time and nearly felt it compulsory to join in the adulation of figures such as Michael Jordan, Cal Ripken Jr., Emmitt Smith and Wayne Gretzky. To not shower praise upon these particular individuals often opened me up to receiving admonishments akin to those one would receive on suspicion of destroying their neighbor’s crops with cries of “heretic” and “witch” likely to follow shortly after. When virtually everyone from my best friend to my own mother was rooting for the Atlanta Braves in the early 90s I was rooting for Frank Thomas and the Chicago White Sox; surrounded by OU fans in my early teenage years, I was usually in possession of a black and orange T-shirt that often became the de facto target for the usual round of raucous, mindless, parentally inspired parroting that so often befell anyone who lie outside the ranks of the peddlers of Oklahoma’s Norman-based golden calf. You could make the argument that I was — and still am — a contrarian. That may explain my initial interest in the game of football. No, not gridiron football — or as I like to refer to it as “hand egg”— but proper football — or as Americans have come to know it: soccer — and the uncanny abilities of one of the greatest players to ever set foot on a soccer pitch, the aptly named Ginger Prince, Paul Scholes. It started how most relationships of the sort happen. You’re generally caught unaware and quite suddenly it strikes you in a manner as though you’d been living in some Platonic cave your entire life. Darkness and triviality are thrown into oblivion as the enlightening rays of the sun suddenly probe into the darkened depths of your ignorance. For that summer, World Cup ’98 was nowhere on my list of priorities. To say I knew little of the game would be as understated as remarking that the Grand Canyon is “a bit wide.” There was little more than a self-professed sense of intrigue in the game. That, coupled with the fact that the United States was rumored to have a team that was actually somewhat decent was what urged me to pay attention. While the U.S. failed to win a single group-stage game that tournament and were sent home nearly as soon as they had set down at Charles de Gaulle Airport, there were games in which I was enthralled by the sheer athletic ability of the participants. Argentinian Gabriel Batistuta hammering in a hat trick against Jamaica, and the incomparable Frenchman Zinedine Zidane orchestrating France’s raising of the Jules Rimet Trophy after defeating quadrennial powerhouses Brazil in the final were breathtaking to watch but the one player who, throughout his country’s run in the tournament grabbed me by the shoulders and commanded my attention, was Scholes. A fearless attacker with an almost telepathic link to his fellow England teammates, Scholes dominated the midfield and secured my fandom with a screaming shot into the top corner of the net against Tunisia. While this would be his only goal of the tournament Scholes was always embedded in matches and when England crashed out on penalties against Argentina I was sufficiently hooked. I immediately set about learning everything I could about the man and found out that there was a soccer league (pardon me as I wince in pain from my adolescent naiveté) in England and that Scholes played for a relatively successful club known as Manchester United. If Scholes played for them then by default I was a United fan. I was lucky to discover them when I did, as I was fortunate to have 13 successive seasons of watching Scholes destroy opposing teams — not single handedly—but at the center of the Man United engine room where he would control the run of play better than almost anyone who crossed his path. Almost every superlative imaginable has been used to describe the way in which the man from Salford, Greater Manchester, has impacted the game of football. Scholes and Manchester United have won 12 English Premier League titles since the league’s formation in 1992 — the majority of which Scholes has had some form of direct impact in securing. Scholes has also been integral in United’s two European Champions League Tournament victories. While he was forced to sit out of the final in 1999 due to suspension, he was redeemed on a rainy night in Moscow in 2008 when United secured their third European championship against fellow England side Chelsea FC. While Scholes has been passed over for major awards for the more glamorous and dazzling of players, he has never been short of adulation by his peers. The humble, tacit professional who rarely granted interviews and preferred to advertise himself on the field has been lauded by teammates, pundits, and opposition who all see him as being the defining midfielder of his generation. Zinedine Zidane himself has publically stated that Scholes was his toughest opposition he’d ever come up against. Barcelona’s Xavi Hernandez and Andres Iniesta (arguably the best midfield tandem playing the game today) laud him as being their personal blueprint and with nearly every game’s end there were always at least two opposing players vying to exchange jerseys with him. 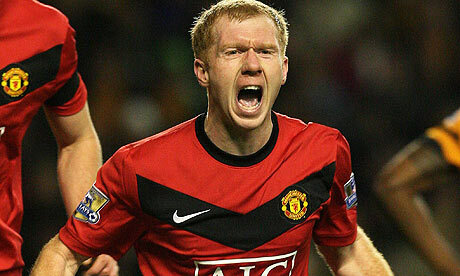 If you were to construct the perfect midfielder, it would most assuredly be Paul Scholes. After announcing his retirement on May 31, I have had to say good-bye to one of the last of my heroes. There’s a sense of finality that comes with the passing of the torch to the next generation. There’s a subtlety to the change you feel when you go from supporting the icons of your youth to supporting athletes as contemporaries in age. Yet nothing will replace the countless mornings in my life when I would wake up to watch number 18 thread the perfect pass, fire the perfect volley, and make “The Beautiful Game” truly beautiful.